Radish assortment from this year’s garden. I probably never ate a radish (willingly) until I was well into adulthood. They just weren’t very good. 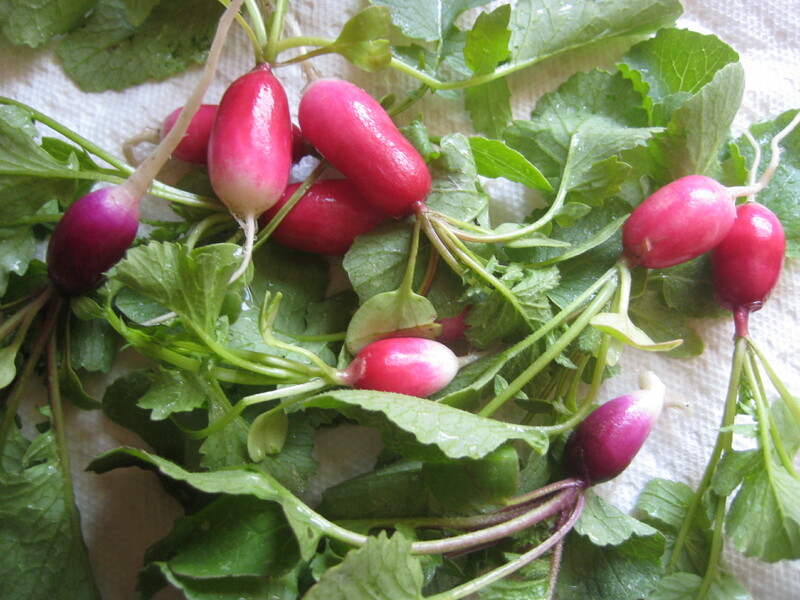 In the last several years though, I’ve discovered there are lots of radishes that actually taste very good. I just have to grow them myself. They are nowhere to be found in the stores. 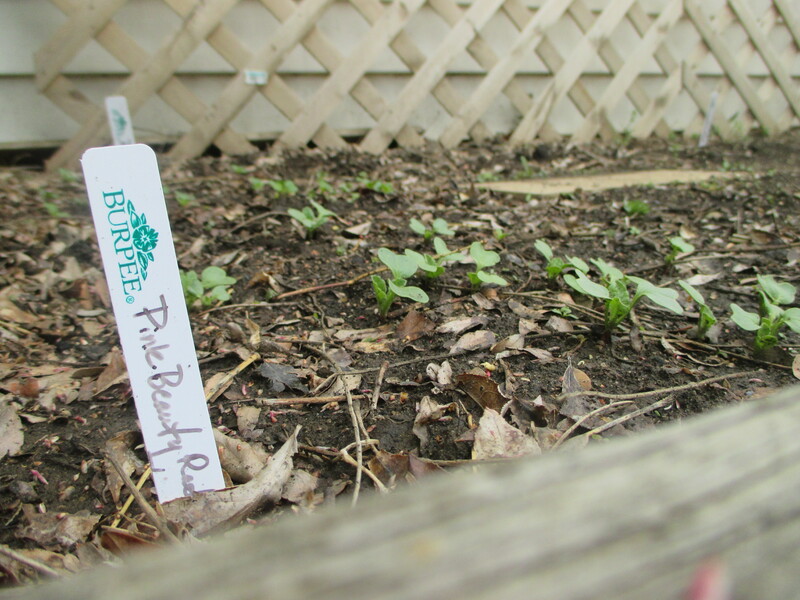 Radishes are my go-to early season garden filler. They are the first thing I plant in the spring, as soon as the ground is warm enough to dig. They are the perfect bridge between winter and summer. They grow fast and easily even in cold early spring temperatures, only taking about 25 days from germination to tasty salad addition. By the time they are all harvested and eaten, it’s time to put in more summery crops. 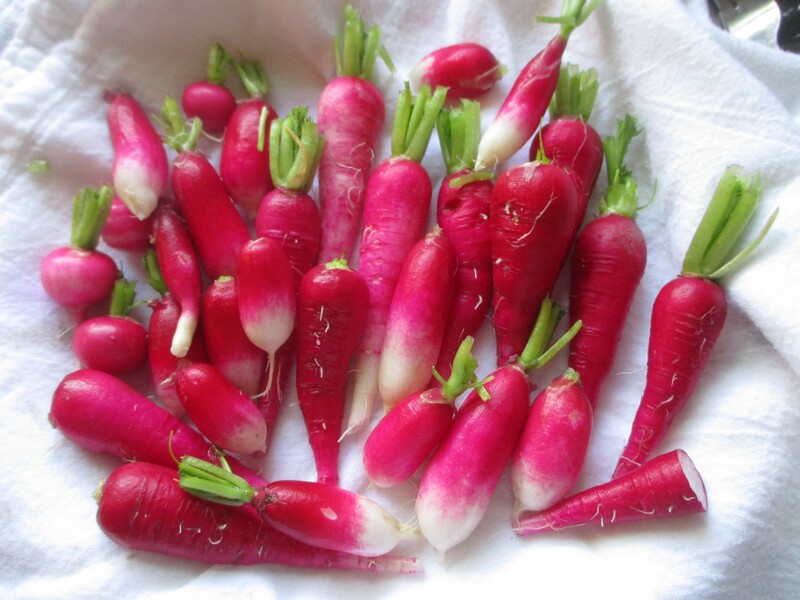 Pink Beauty radishes, early in the season. 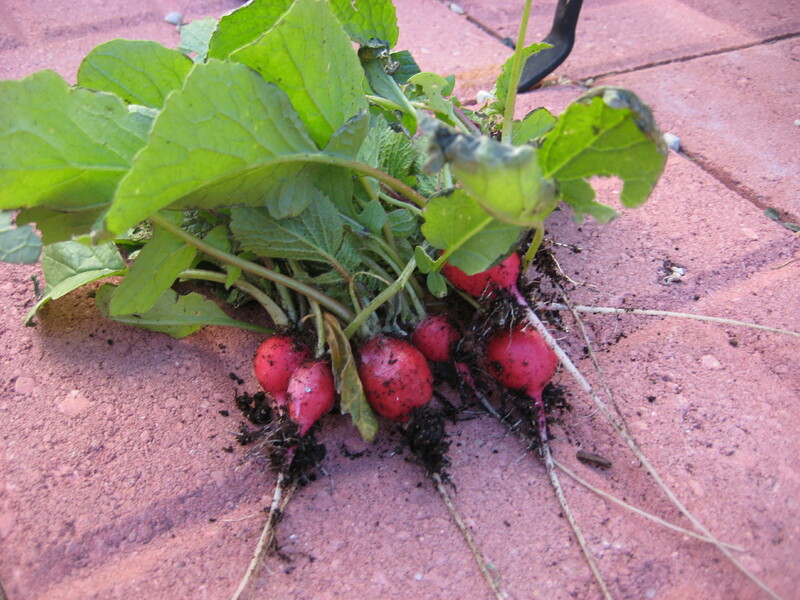 French Breakfast radishes almost ready for picking. 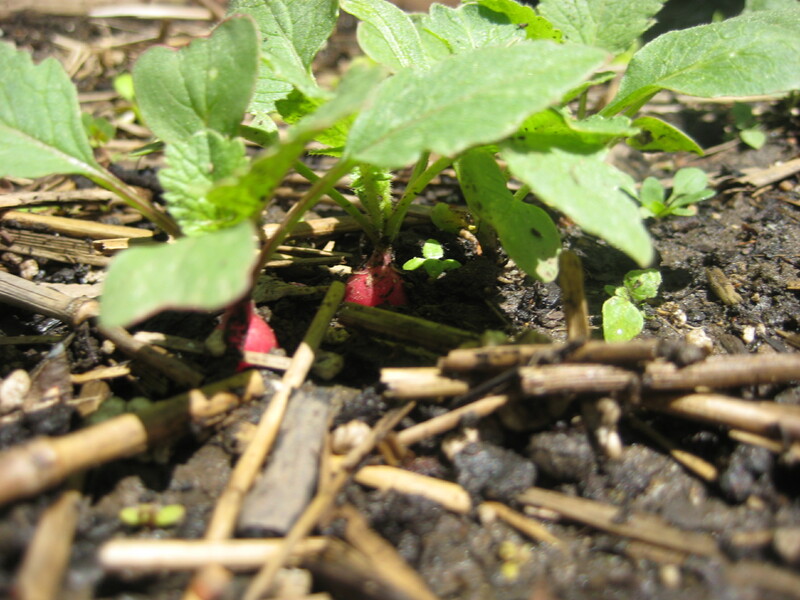 Now, the whole radish is edible. The leaves can be added to salads, soups, stir fry, or wherever a bright green slightly bitter and peppery punch is needed. Truth is, I don’t love to eat the leaves. Sometimes they are fuzzy, even “spikey” as my kids say. I prefer to toss the leaves in the compost and let them nourish us that way. Cherry Belle radishes with their greens. For me, the radish root itself is where it’s at. Fresh from the garden they are crisp and full of zip. Even better after being chilled in the refrigerator for an hour or so. Radishes have varying degrees of “heat”. Seed catalogs usually inform on the level of bite that can be expected. Terms such as “mild”, “pungent” and “hot” give an idea of what to expect. Radishes are great by themselves, but they also make delicious dippers. Any veggie dip would work. However, a real treat is to make an herb butter compound and serve that room temperature alongside chilled radishes. Oh my. Butter and radishes are a match made in heaven. If it’s too early in the season for fresh herbs, dried are a good substitute. My kids love plain butter with just some garlic salt mixed in. And if all it takes is a little butter and garlic salt to get my kids to eat radishes, then I’m in. Because I remember being a kid who would not eat a radish. So I consider it a success to have raised radish eaters. 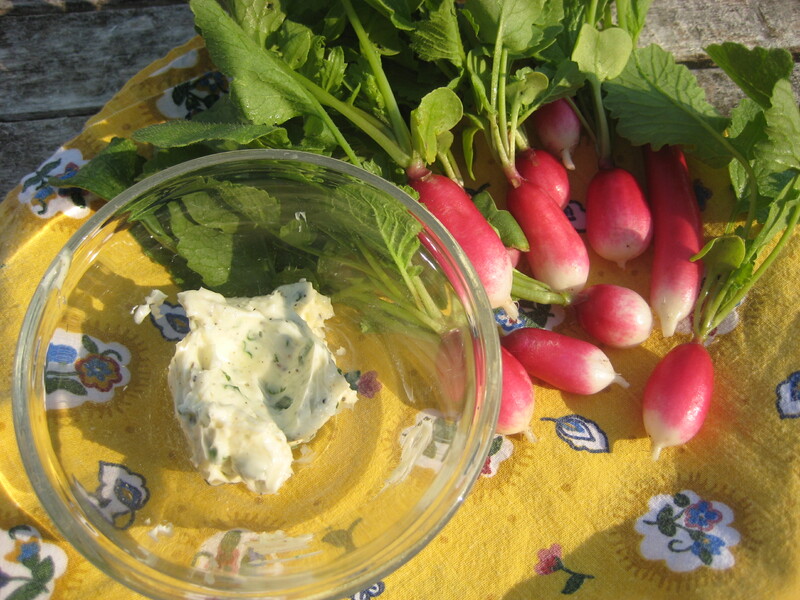 Fresh-from-the-garden French Breakfast radishes with an herb butter. While the butter dip is my favorite way to eat radishes, there is no denying that they are perfect for salads. 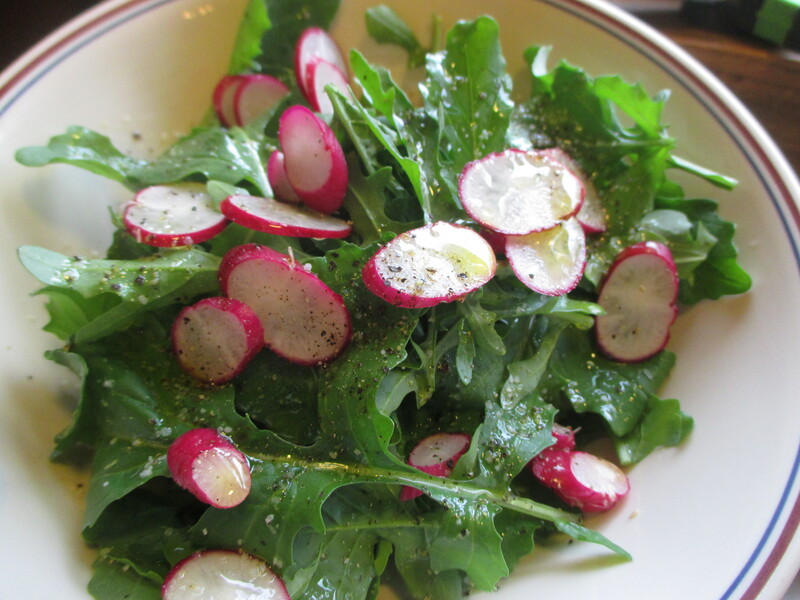 A peppery spring salad of arugula and sliced radishes with a simple drizzle of olive oil and sprinkle of salt and pepper is something I look forward to every year. It’s no coincidence that arugula and radishes are ready to harvest at the same time. They are a tasty combination! If my radishes are getting a little “long in the tooth” it’s a good time to consider roasting them. Like all root vegetables (think carrots, parsnips, etc) radishes can be tossed with some olive oil and salt and roasted in a hot oven. There are plenty of other ways to enjoy radishes. A quick online search or scan of Pinterest will yield tons of ideas. I’ve never grown a fall crop of radishes, but maybe it’s time to start. They are pretty much the perfect start to the gardening season, I imagine it’d make a fitting end to enjoy them then too. Radishes come in many shapes and colors. It’s worth seeking out new varieties in seed catalogs. This entry was posted in Vegetables and tagged cherry belle, french breakfast, herb butter, ostergruss, pink beauty, radish, radish greens, spring vegetables. Bookmark the permalink. Ravishing Radishes! A wonderful red addition to a salad ~ especially when tomatoes are not at their best! Thank You, Angela! informing about gardening ideas that are inspiring to many of us.